First there was IBM's OS/2 and then came Microsoft Windows 95/98 and OS/2 was no more. In the battle for the most used wordprocessor, Wordperfect put up a valiant fight but alas, Microsoft Office took over - same with Lotus 123 which was soon replaced with Microsoft Excel as the most popular spreadsheet program. Then came Netscape and Microsoft countered with Internet Explorer and then Netscape was no more (or at least not the same as it once was). Then came Real, a really cool streaming application with a "free" lite version and a "paid" Realplayer Plus version and Microsoft responded with Windows Media Player, a completely "free" version. While Real is still around, and still a popular media player, it isn't nearly as dominant as it once used to be. Microsoft has steadily eroded Real's market share. It appeared as though just about any popular software application would soon be dominated by Microsoft through Microsoft strong-arming their partners, giving stuff away for free, and other Microsoft tactics that landed Microsoft in trouble with the DOJ and the EU. Many of the aforementioned companies have lost tremendous market share or worse - have become irrelevant. Then came RIM (Research In Motion) and their popular Blackberry hardware and software that gives users wireless access to their email using push technology. RIM's hardware and software are a propietary solution, but their wireless email just plain damn works! It's why Blackberries became so prevalent. Relatedly, it's also why Skype became so popular - it just plain worked - even through just about any NAT firewall. But now, with attacks from NTP over patent issues, and competition from Microsoft, RIM appears to be headed down a similar path to becoming irrelevant. This time NTP and not Microsoft earns the distinction of being the "villain" in knocking off a market leader through questionable tactics, however Microsoft wasn't exactly standing idly by while NTP sued RIM over patent infringement. Indeed, Microsoft has been not-so-quietly developing a RIM-killer of their own, a push-email solution that runs on Windows Mobile 5.0 devices giving users the same Blackberry-like experience. If this were a wrestling match, NTP would be the company that slammed RIM over the head with a steel folding chair, but it could be Microsoft that "snuck" into the ring to pin RIM down for the count. 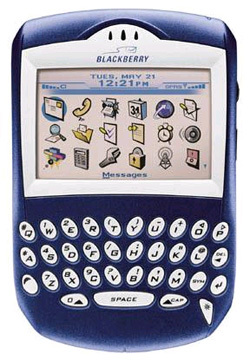 I have to admit, as much as I love Blackberries and the loyal following they have built, I'm afraid that even if NTP weren't suing RIM and even if the Blackberry service isn't shut down in the near future, that Microsoft will soon win the war of push-email devices. The only thing preventing Microsoft from dominating push-email devices today is that Windows Mobile 5.0 phones are so damn expensive. But they have come down in price and Blackberry phone devices aren't exactly cheap either, nor is the enterprise Blackberry server. Microsoft CEO Steve Ballmer is keynoting at 3GSM still to come tomorrow, and from what I learned from Microsoft' PR firm, he will discuss "how enthused Microsoft is about the improvements Microsoft is bringing to the way people enjoy wireless email and entertainment on mobile phones". Today at 3GSM, Microsoft and partners announced some interesting news that relates to Microsoft's aim to be a "Blackberry killer". First, and most importantly - Microsoft announced the availability of Direct Push Email Technology. An upgrade for the Messaging and Security Feature Pack (MSFP) is available for Smartphones powered by Windows Mobile 5.0 from some of world’s major operators including Cingular Wireless, Orange, T-Mobile and Vodafone. 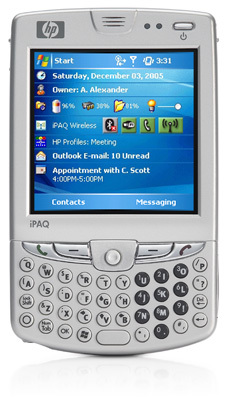 They also announced several new Windows Mobile devices with MSFP. Microsoft’s device partners introduced several new devices to ship out-of-the-box with MSFP. New devices include HP iPAQ hw6900 Mobile Messenger (blogged this morning), Fujitsu Siemens FS Pocket Loox, Gigabyte g-Smart and g-Smart I handsets and ASUS P305 3G-enabled Smartphone. Microsoft announced that it is enhancing music download capabilities on mobile phones. Microsoft and Motorola strengthened their existing relationship by announcing the integration of Windows Media technologies, including Windows Media Digital Rights Management, on a number of Motorola handsets, providing the ability to play back content purchased from the breadth of pay-per-download and subscription music services. Motorola, the world's second biggest mobile phone maker behind Nokia, will launch between one and three Windows Media phones in the second half of 2006. To aid small businesses, Microsoft pointed out that there is now immediate availability of Direct Push email technology and but also remote device management features for Small Business Servers from Vodafone and T-Mobile Netherlands, delivering better messaging and email solutions to small to mid-sized business. Finally, in attempting to lower manufacturing cost for smartphones, Microsoft has joined forces with Texas Instruments to introduce the industry’s first single-core smartphone chipset which will enable smartphones to run on less-expensive feature-phone hardware. I should mention that if you want to watch a live web cast of Ballmer’s 3GSM keynote tomorrow, and see if Ballmer can top his infamous Ballmer dance, go here. So with Microsoft's latest MSFP out with it's essentially "free" licensing model, and RIM under attack from NTP, does this mean Microsoft will kill yet another industry star? If history is any portend of the future, then RIM's future doesn't look bright, even with Blackberry's announcement of a workaround that gets around the NTP patents, because Microsoft will do what Microsoft does best - copy what others do, do it better and for less money.